An obstetrics application for use on the iPhone has been cleared by the Food and Drug Administration, says the company that created it. San Antonio, Texas-based AirStrip Technologies, which bills itself as a pioneer in mobile medical software applications, announced that it has received FDA clearance to release the AirStrip OB application for use on the iPhone. The application is now available for download to qualified physicians at Apple's App Store. 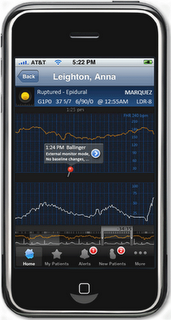 AirStrip OB allows obstetricians to use their iPhones to remotely access virtual real-time and historical waveform data for both the mother and baby, including heart tracings and contraction patterns, as well as nursing notes and exam status. The data is sent directly from hospitals' labor and delivery units and can be accessed on the iPhone anytime and anywhere the doctor gets a cell-phone connection. "We believe that AirStrip OB for the iPhone is truly a milestone for mobile healthcare technology," said Cameron Powell, MD, president and CMO of AirStrip Technologies. "By using the iPhone's groundbreaking technology, AirStrip OB sets the bar for a higher standard of care, and utilizes the iPhone's full potential in a healthcare setting." Noting that labor and delivery is one of the riskiest and most litigious environments in healthcare, and that communication errors lead to a measurable majority of actionable bad outcomes, Powell added that AirStrip OB aims to mitigate that risk by closing the communication gap among caregivers. Already available on PDAs and Smartphones and in use by a growing number of obstetricians nationwide on Windows Mobile devices, the AirStrip OB/iPhone application provides doctors with multi-touch capabilities to quickly scroll and zoom through critical data, AirStrip executives said. They say the application is highly intuitive and maximizes real estate on the iPhone's touchscreen, providing rapid visualization of more medical data per screen compared with any other mobile device or Smartphone available today. It delivers vital information about a number of patients across multiple hospitals. "The demands of a physician's day necessitate their periodic absence from labor and delivery and other acute care environments," Powell said. "As a result, doctors need easy-to-use, standards-based, intuitive mobile applications that can be quickly downloaded with the necessary security and configuration files in place, and with hospital perinatal systems up and running live." The hospital purchases the AirStrip system, which works in tandem with the hospital's existing patient monitoring system, and doctors can then install the AirStrip OB application on their iPhone.